CR1 insTand TM for sit-down use. 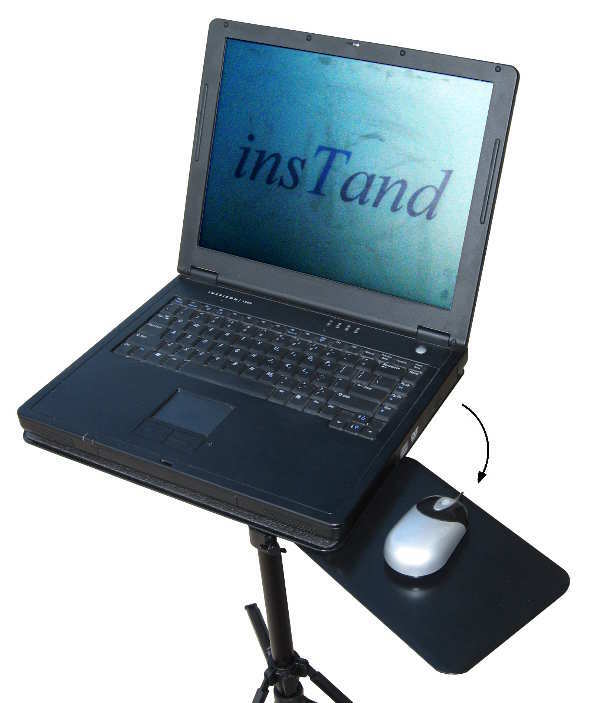 insTand gets your hot computer off your lap - lets you sit comfortably and move around at will. High-tech materials provide a stable platform free from wobbling or vibration. 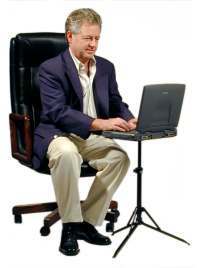 Features patented ergonomic tilt feature to adjust keyboard angle for comfort. Model CR1 adjusts from 14" to 31" high. Folds really small - like a small umbrella. Fits in most laptop cases... folds to 2" x 13"
Ultra-light, extra-strong tripod weighs just 22 oz. Anodized aircraft grade aluminum and composites. Basic CR1 includes tripod, standard 11" x 13" tray, and carry bag. BASIC CR1 INCLUDES - sturdy high-tech tripod with handy leatherette carry bag and 11" x 13" model CT4 tray-top. Doing the happy dance. Bought this basic Instand on a whim from the in-flight catalog. I have a closet full of similarly intentioned devices, some pretty expensive. All not quite right, you know? I bought this only after examining the return policy very, very closely. Well, tough, you can't have it back. It is beautifully designed and it feels like quality..."
As used daily by thousands of happy Court Reporters!